He is such a handsome young man! Love the do! He is so handsome...all of your children are just beautiful and you do such wonderful photography! Love the hair - great picture! 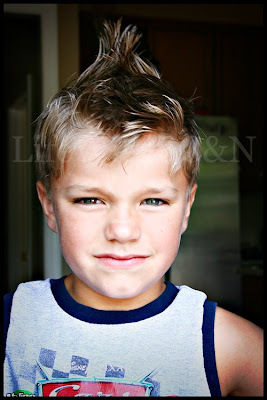 I'm surprised he didn't let you before- most boys love the mohawk do! Shoot, Scott is obsessed! So cute! It took me a while to get Riley to let me do it too. Finally, for our family reunion weekend on the 4th, he let me do it and everyone loved it. He asked me to do it again the next day actually. love it! and he looks like he does too! You've gotta a handsome young man there! wow, I can't believe how much older he looks! He's a heartbreaker! I love the hair and his eyes. You captured him perfectly-I do see a little attitude there-is it just me or was he po'd? ?